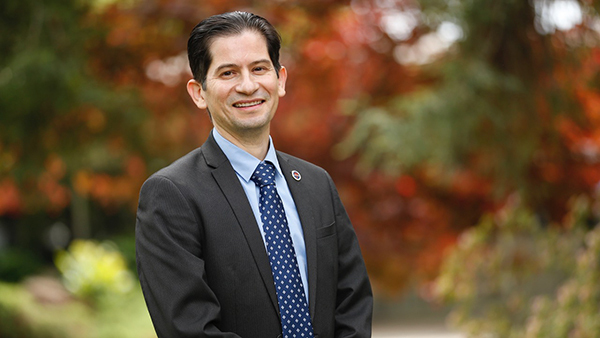 Dr. Saúl Jiménez-Sandoval, a veteran academic administrator with extensive ties to the Central Valley, is Fresno State’s new provost and vice president for Academic Affairs, effective July 22, 2019. President Joseph I. Castro announced the appointment on April 5. The provost is the University’s chief academic officer and serves as its leader when the president is away from campus. Jiménez-Sandoval joined the Fresno State faculty in 2000. During his 19 years of service at the University, he has served as professor of Spanish and Portuguese, coordinator of the Spanish master of arts, chair of the Department of Modern and Classical Languages and Literatures, interim associate dean of the College of Arts and Humanities, and dean of the College of Arts and Humanities. A multilingual scholar, he recently helped launch the new Portuguese Beyond Borders Institute, in collaboration with fellow deans of other Fresno State colleges. As a scholar, Jiménez-Sandoval studies poetic discourses, critical theory, Spanish American literature and Lusophone cultural productions. Among his academic honors are two nominations for the Carnegie U.S. Professor of the Year Award.